PART 2 OF THE BOOK REVIEW AND INTERVIEW WITH THE AUTHOR. I’ve reviewed part of the book earlier. You may click here for the previous post. There are two reasons for splitting the book review. One, the book was too complex, at least for me, to digest in one quick read. I had to read the first part of the book again. The second and third part of the book, were different, even if connected by fine threads to the first part. The second part of the book began on a new note, in which the author’s admiration for literature and films came shining through. Unfortunately, there is a generation gap, between the author and myself. I haven’t had a chance to read all of the authors he admires nor watch all the films he mentioned (and perhaps I will not follow all his recommendations). His essays in this sphere, included those on : Buster Keaton, Orson Welles…His insights into the film – La Dolce Vita was interesting and one sentence stood out: The movie was complex to my mind. 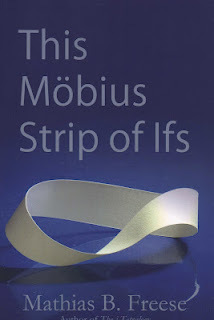 I didn’t get it, nor did I understand that Fellini was education us in how to see without a straight narrative (this quite reminded me of the book itself – This Mobius Strip of Ifs). The author’s essay on Kazantzakis is what I liked best. We do have a choice to reach for what we can, or reach for what we cannot – and the latter makes our life much richer and as the author adds, also dearer. The essay, ‘Camera as remembrances of things past’ now only portrays the value of memories captured for eternity, but hints of the changing times. It is in the last part of the book that one gets to see the sensitive side of the author. He talks about the pangs which a parent feels when his child first steps into school, the evolving role of a father as his daughter begins to grow, the courage of one of his daughters who was suffering from Chronic Fatigue and Immune Dysfuction Syndrome and the emptiness he felt when she committed suicide. One of the essays is titled: I really don’t know me and I really don’t know you. This can be said of the book itself, the nuggets of wisdom have to be dug out patiently, decoded and understood, because else they seem to be lost in the outpouring words and yes, the unheard scream. To sum it up: This book is not everyone's cup of tea. When I first began to read it, I struggled as a reader. On hindsight, I do not regret committing to reviewing it and to reading it. 1. If you could rewrite this book, what would you change, if at all? I have read and re-read the book several times over in search of what I feel are the latent as opposed to the manifest themes. At moments I am blind to what others, such as yourself, have discerned and detected in the book. As I have said in the book we are often blind to ourselves. What concerns me the most is my “failure” to spot poor phrasing or awkward sentences. I will rewrite and revise some sentences at the end of the year so as to make the book better written, more felicitous. That said, I would not change anything at all. The book stands as it is. 2. You have quoted many authors, who is your favourite and why? Kazantzakis appeals to me the most for the passion he includes in his writing, for his descriptive powers, for the organic simplicity of his writing which often carries the most profound sentiments one can imagine. Above all, he makes you feel! I struggle all the time to have the reader feel, but Kazantzakis is at the top of the mountain and I am miles away. 3. One of the things that the book, in the first part, reflects deeply upon is the need to be ‘free’. This is also reflected in the other sections of the book. How are you progressing in your endeavor to be free and what does being free truly mean to you? I really feel that these two questions should be returned to the questioner. For me to be free is to be psychologically free, free of culture, religion and society, of friends and family. I believe the task of each of us is to de-condition ourselves of the rust that grows all over our minds. Often we come to die not knowing that we are slaves of systems and religions and of others. Eastern thought, as I see it, deals with this issue, although it ties itself up in knots just as thorny as religious dogma and doctrine. I read Krishnamurti because he abhors conditioning, questions each of us to question ourselves and refuses to offer the balm of answers. He takes no prisoners and detests disciples. 4.What attracted you to Krishnamurthi’s teachings? Did it help you deal with your struggles in life? Presently I am reading Krishnamurti’s last book, Krishnamurti to Himself ,which he dictated into a tape recorder before his death in 1985. He must be read closely, carefully and one must be aware; you cannot sweep through pages of his thinking, for you will come away with nothing but a blur. I was attracted to his teachings by his brilliance, his refusal to give answers, his posing better questions of myself that I had difficulty phrasing. He was new, he was refreshing and he stunned the intellect. In the past year I wrote a manuscript about my three decades of reading him and how I had to disenthrall myself from him as he can become a very powerful presence in one’s mind. He has made me see. 5. During your tenure as a teacher how did you try and change the system? You seemed to have skimmed the surface when describing such incidents. As you look back, what can you be proud of trying to change? I am being feisty now. I had three essays about my experience as a teacher and other random comments are strewn throughout the book. The book, if we wish to narrow its scope, is about education in all areas of life, not just the suffocating dreariness of schools and their systems. I am most proud if that is the word of working on myself. I believe people get into a mind set about change. Change to what? Often reform is just a change from one glove size to another. Often revolutions are followed by counter-revolutions and the poor schnook in the street is worse off than ever – French and Russian Revolutions, etc. Look at the so-called Arab spring and Egypt in particular. Since I began teaching in 1962-63 there have been “reforms” galore and the American school system is as decrepit as ever. The system will not abide change for it changes the system. Notice the language we use. School system (?) with all the defects of systems anywhere. You may not like my “answer,” but here it is: change yourself and others might be affected by that. I expect nothing from change as we know it and how we go about practicing it. I am so terribly weary of the injunction to change the system if you don’t like it when that person, he or she, has never changed a whit in his or her own life. 6. Did writing the book help you come to a closure on many issues that were haunting you – such as the relationship with your mother? Have you found peace? Closure is a societal myth, a fabrication without meaning. When you are stricken by death in your family, you never forget it and you never get “over” it for as long as you live. If you do, then I argue you have a very dull sensibility. As to peace, why would anyone want peace? That is an abstraction that I cannot accept. It sounds as if one comes to dead stop on an ocean liner. As to my relationship to my mother, isn’t that a private issue for me to wax and wane over? I can share that I am in no way immobilized by my past relationship with her nor that I am haunted like some character in one of Poe’s fever dreams. I argue irascibly that to find peace is to be dead in life. Your genes demand better of you. 7. Why isn’t there any instance of a joyous moment reflected in your book? True life is a struggle, but life is also a roller coaster ride, there are highs and there are lows. Most people seem to have let you down in life. Are your expectations from others too high, even as you say, Overdraw me Lord and who cares if I break. I can only say you missed them, memories of my wife, interactions with my son, essays about my daughter at 11 and my son at 5. If you review my talk about the Holocaust I specifically tell the audience how I deal with that horror in myself; that I do have joy in life, that I am very much alive. Why does the reader assume that if the writer speaks of dark things in darker ways he is an inch away from throwing himself off a bridge? My essays on filmmakers and on the books and films I’ve seen reveal, at least to me, my pleasure in all these things. One famous historian of the Holocaust had his sister embroider throw pillows with such sentiments as “Life is good,” “Smell the flowers,” et al and gave them to her brother to assuage what she felt was his pain. He disabused her of that notion that he was depressed and all that by telling her this was his life’s work, to understand, to learn and to gain insight into the Holocaust. I subscribe to his thinking. 8. Since I prefer to look at the silver lining, instead of the dark cloud, I’d like to end my interview by asking: What has been your most joyful memory? Marrying my deceased wife, Rochelle. I haven't heard of this book so thanks for sharing. You interview gave really good insights into the author. I read both the reviews, part 1 and part 2. I realize from your posts that the various sections in the book are very different. Perhaps it would have been better for the author to have published each section as an individual book. I, would prefer to read those chapters covered in Part 2 of your review. I came here from GoodReads and have sent you a friend request.